FIM Your Way to Multiple Colas! So what exactly is FIMing? FIMing is an easy way for growers to dramatically increase their yields while also making the plant more manageable for limited spaces. I know that sounds too good to be true, but it’s definitely the case! The problem with the natural growth pattern of the cannabis plant is that it tends to be shaped like a Christmas tree. This is inefficient, and not very good for indoor growing since the main cola will typically receive much more light than the rest of the plant. 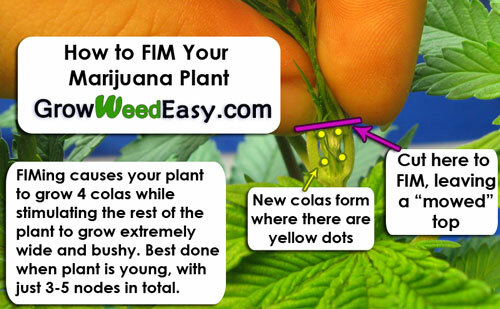 When you FIM your marijuana plant, it grows 4 main colas instead of one (this is where the extra yields come from). Next, the grower would typically tie those 4 colas down a bit to help force the plant into having a flat canopy. This allows you to lower your lights and makes it so most of the plant is receiving a higher overall amount of light. 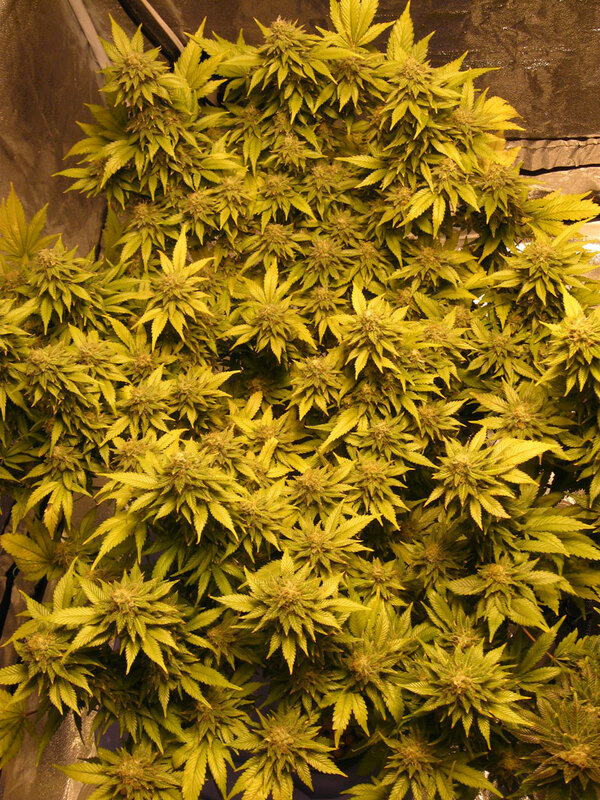 Whenever you see a picture of a marijuana plant with multiple large buds that are at a similar height, the grower almost certainly used FIMing or another technique called ‘Topping’ to achieve this. In tiny stealth microgrows, there isn’t always room for an effective FIM. Your plant will get close to skipping the vegetative stage, and that’s the only time to FIM. I know that sounds like a joke (it was, a bit), but some places have limits to the amount of weed you can possess, and FIMing could actually get you in more trouble in some cases because of all the extra buds you will produce. 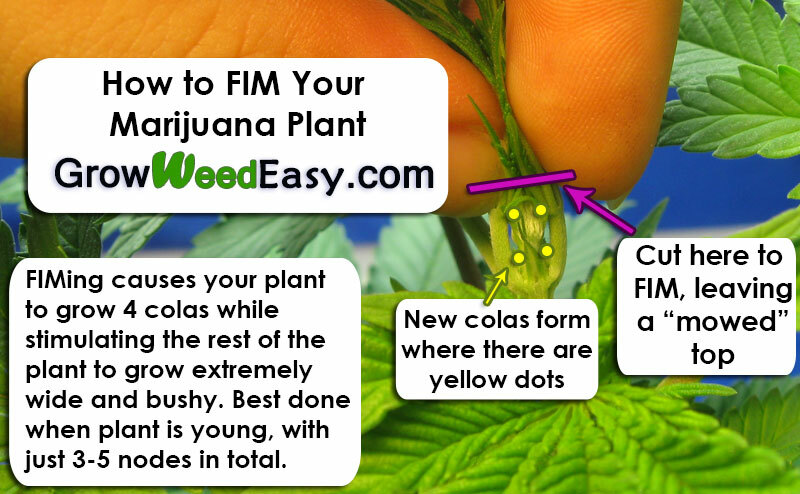 Topping is a technique similar to FIMing, wherein you cut a young cannabis plant to create extra colas. However, unlike FIMing, the Topping technique produces 2 colas instead of 4. If you would like to learn how to Top your plant, check out our Topping tutorial on GrowWeedEasy.com. This article is about FIMing, and does not go in depth about Topping. FIMing can be a superior choice in many cases. Why FIM instead of Top? When you FIM your cannabis, you only need to pinch the newest growth, which doesn’t really stress your plant much. 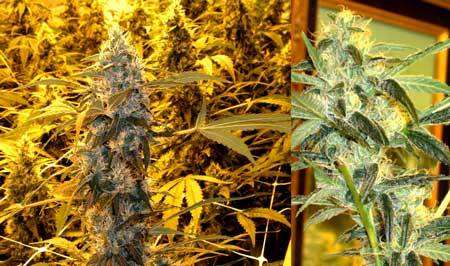 With Topping, totally removing the newest growth is necessary, which is a stressful event for young marijuana plants. FIMing barely slows down plant growth; Topping slows down plant growth considerably for a short period. When you FIM your plant, you will see recovery move at a much higher speed than with Topping. When I FIM one of my plants at the beginning of the day, I can usually already see it adjusting by bedtime. FIMing creates 4 main colas at once, while Topping only creates 2. Double the main colas…no explanation needed! It’s easy to FIM a plant more than once! I wouldn’t necessarily advise this tactic for growers who are new to FIMing, but definitely keep this in mind! 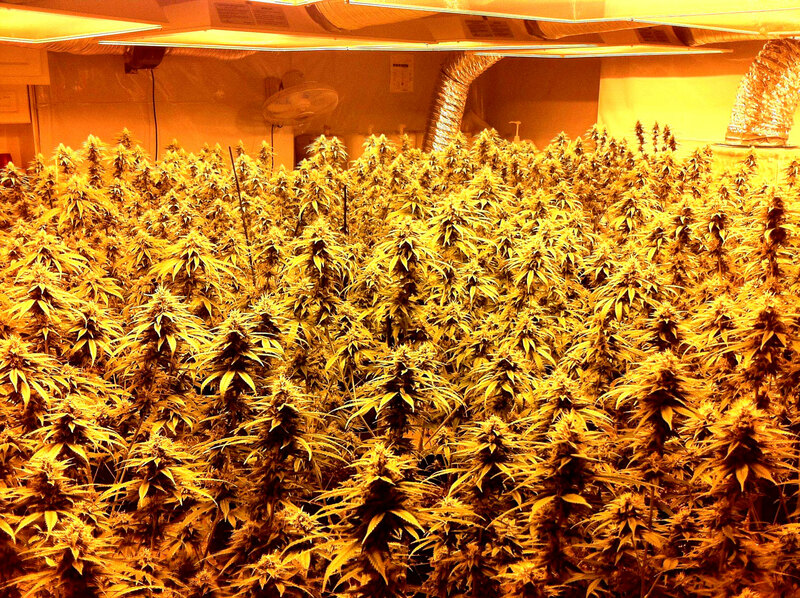 You can FIM your cannabis plant more than once, and with some Low Stress Training, you get plants with dozens of colas like the one to the right. Nebula says – In my experience, FIMing causes my plants to grow bushier than topping, even when I do it to the same strain. 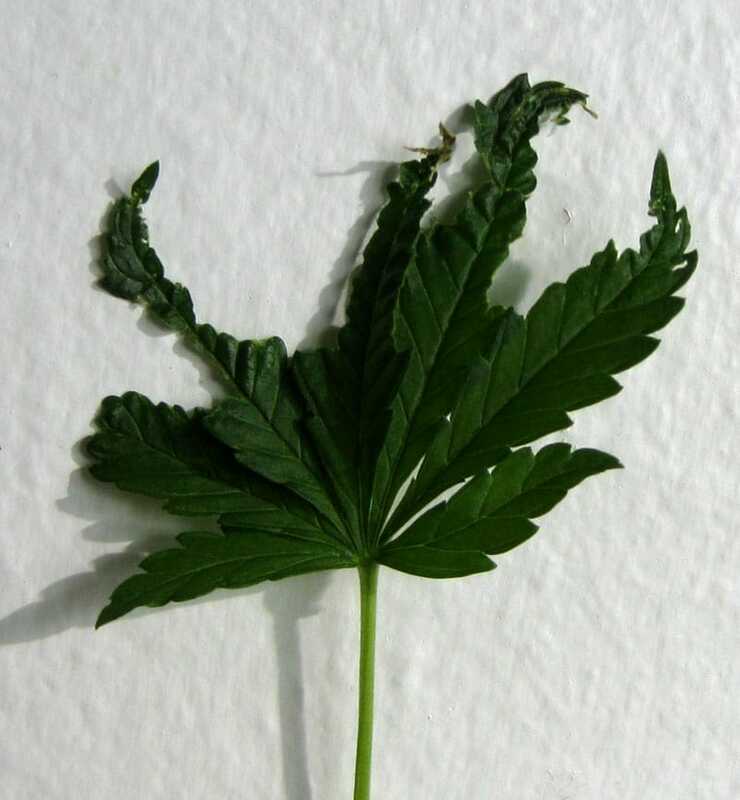 I will choose to top marijuana plants when I’m trying to achieve a specific shape that requires a complete split of the cola, like main-lining. Sirius says – Although this last point is anecdotal evidence, I have to say that I’ve experienced the same thing. FIMing causes plants to dramatically “bush out” more than topping. Pinch vs. Cut – What method do we use to remove/damage the new growth and force new colas? Amount – How much do I pinch/cut? Timing – At what point in the plants development do we FIM? When you’re FIMing your plant, you have the option of either cutting off a piece of the new growth or pinching it. 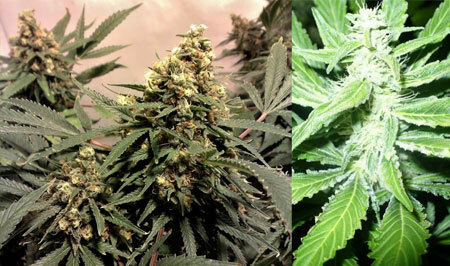 Both have the potential to work equally well at forcing the plant to create new colas. However, I strongly recommend pinching your plant instead of cutting it since pinching leaves more room for error. In my last grow, I saw a few weird looking leaves that appeared to be chewed-up. Upon further examination, and judging by where I found them, I determined that they were actually pinched leaves! The plant kept those leaves, and used them to make energy all the way til harvest! When FIMing your plants, the amount you’ll want to pinch is actually quite small. You’re basically pinching the tips of the leaves of the newest growth on the main cola that hasn’t ‘stretched-out’ yet. See the picture further down for a good example. The first pinch or cut in a FIM should happen when your plant has 3-5 nodes (or sets of leaves) in total. Once that initial FIM has been completed and the plant has recovered, a grower can use his/her discretion to determine when to FIM again as it’s mostly based on plant health and desired shape. Just remember to make sure your plant looks healthy and recovered before FIMing again! Now that you know the basics of FIMing, take a look at some of these other growing techniques. I use these same techniques (in combination with FIMing) to maximize the amount of weed I get per harvest while keeping the total amount of work low. There are MANY other techniques you can use in combination with FIMing to increase your yields, but in my opinion, these two in particular (with FIM) offer the highest return on investment. 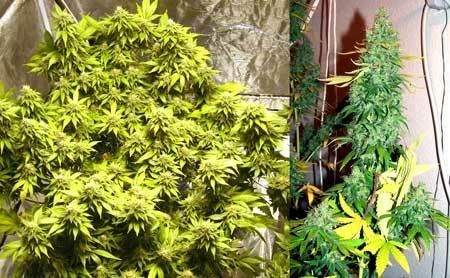 Low Stress Training – Train your plants to grow as a flat surface; easily double your harvest. Defoliation – Advanced, but well worth it. More buds exposed to light means more, bigger buds! FIMing is such a versatile technique, that pretty much any marijuana strain is a perfect candidate for it! However, some strains are experts at recovering and getting HUGE RETURNS on growth control techniques! These are a few strains I’ve grown personally that each gave me at least 6 ounces or dried & cured, super sticky bud per plant. Sirius: This plant effortlessly bends, breaks, recovers, and flourishes. That plus a naturally high yield, pungent diesel smell, and high potency make this a Aurora a must have. Seriously, try growing it! Sirius: Funky smell, crazy potency, and super resilience are all attributes of the Pure Power Plant. I’ve once cut off the top 4 nodes of this strain in a panic(it got too big, too fast). This plant totally healed its stem in 2 days and never stopped growing the whole time. Sirius: Wonder Woman has recently become one of my favorite strains. You can FIM it in the morning and watch it recover before the day ends. That combined with crazy fast growth patterns, the highest yields on this list, and a nose-wrinkling diesel smell make this strains name remarkably accurate.